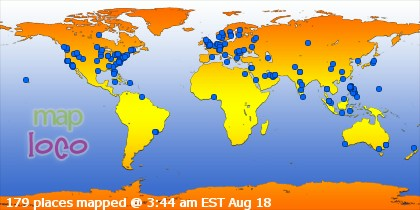 I watched a concert here one summer many years ago. The 868-acre Red Rocks Park and Amphitheater, nestled in the Rocky Mountain Foothills just 15 miles outside of Denver near Morrison, was once listed among the Seven Wonders of the World—and with good reason. Ship Rock and Creation Rock, the largest of the monoliths, tower 300 feet above the Red Rocks Amphitheater. These massive brick-colored sandstone monoliths are taller than Niagara Falls. Red Rocks Park is home to a healthy population of Colorado’s beautiful plants and wildlife. In this area, the Great Plains run into the Rocky Mountains at an elevation of more than a mile, creating a home to a unique blend of animals. An excellent way to spot the various birds, deer, foxes and smaller rodents is to utilize Red Rocks’ hiking trails. The Trading Post loop is 1.4 miles and meanders through the gorgeous rock formations of the park. 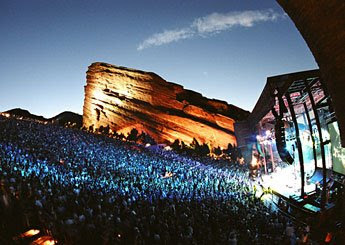 Red Rocks Park has been named one of the best concert venues in the world. This incredible open-air amphitheater was designed to preserve the natural beauty of the great sandstone ledges. The massive monoliths act as natural sound walls, creating unparalleled acoustics. The Amphitheater has seen several world-renown acts, including the Grateful Dead, Dave Matthews Band, John Denver and The Beatles. The natural beauty of Colorado is captured in this amazing park and concert venue, providing 360-degree views of Denver and the Plains for over 200 miles. 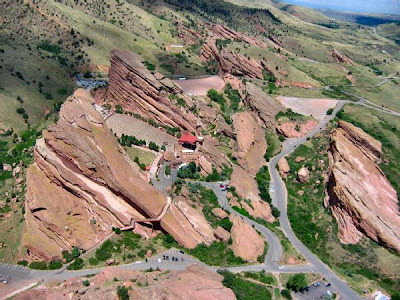 Red Rocks is a geologically formed, open-air amphitheatre set in the Rocky Mountain Foothills. The amphitheatre's unique features include two 400-foot monoliths and a naturally occurring theatre set on a mountain stage. This setting, which seats 9,450 people in 70 rows, provides perfect acoustics and has attracted performers worldwide. 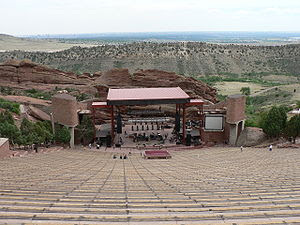 The amphitheatre, completed in 1941, is part of the 818-acre Red Rocks Park, located 15 miles west of Denver. Red Rocks Park and Amphitheatre hosts nearly one million day visitors and concertgoers each year from all over the world. The new Visitor Center offers park visitors a newly designed facility, intergrated into the natural rock formations. Red Rocks Amphitheatre is a rock structure in Red Rocks Park near Morrison, Colorado (west of Denver), where concerts are given in the open-air amphitheatre. There is a large, tilted, disc-shaped rock behind the stage, a huge vertical rock angled outwards from stage right, several large boulders angled outwards from stage left and a seating area for up to 9,450 people in between. The amphitheatre is owned and operated by the City and County of Denver, Colorado.